Plum trees are not as common as apple or pear trees and there are several reasons for this. We don't believe plums are complicated to grow and these articles on growing plum trees will show you exactly how to get the best from your plum tree. The trick with plum trees is to select the correct one for your garden and tastes. The eventual size of the tree is key as is the form / shape it is pruned to. You also need to consider the pollination needs of your plum tree, many are self-fertile but some are not. Several factors affect the size of a plum tree, one of them being the rootstock on which the tree is grown. Almost all plum trees are grafted onto the stem of a different plum tree. This lower stem is called the rootstock. The reason for this is simple. If a plum tree was left to grow on its own roots the resulting tree would be far too large for most gardens. To get round this problem, plum tree growers graft the required variety onto the roots of a tree which does not grow so vigorously. 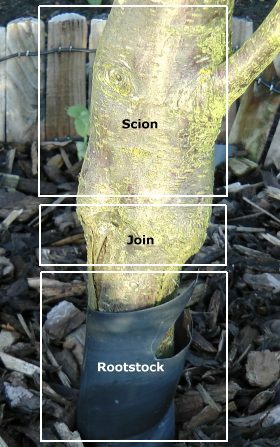 So, the rootstock shown in our picture is from the less vigorous tree, the join is where the two trees are grafted together and the scion is the variety of plum tree which is wanted. The plums which grow on the tree take all their characteristics (taste, size, shape etc.) from the scion part of the tree. Although there are many varieties of rootstock used for plum trees, only three are commonly available in the UK. The first is St Julien A which should give a tree about 3.5m to 4m (11ft to 13ft) high, Pixy (sometimes called Pixie) with an eventual height of 2.5m to 3m (8ft to 10ft) high and the relatively new VVA1 reaching 2.5m / 8ft. Regular pruning can reduce the height of trees on all three rootstocks by about 15%. Although rootstock has the major influence on the eventual height of your plum tree, growing conditions can also affect its height. Perfect growing conditions will result in a taller tree compared to less favourable conditions. As mentioned above, regular pruning can also reduce the height significantly. Plum trees can be trained to grow in a variety of shapes and you will need to know what shape of plum tree you want before you buy a tree. There are four basic forms of plum tree, pyramid, bush, standard and fan shaped. If you are buying a plum tree to grow as a standard or fan shape then specify this when buying the tree. A standard tree is one where the main trunk has no branches coming off it low down, the head of the tree is formed higher than normal. There are no particular advantages to this shape of tree but some people find them an attractive feature in the garden. A fan-shaped tree is normally grown against a wall and has branches which are tied into the wall. This form of pruning / training needs to be started when the plum tree is being grown at the nursery. Some plum trees are self-fertile and some are not (click here for an explanation). Self-fertile plum trees can be grown on their own and will produce plums. Those trees which are not self-fertile require another plum tree nearby which produces blossom at approximately the same time. Click here to see our page which lists varieties that are self-fertile and which varieties can pollinate each other. AT WHAT AGE DO PLUM TREES PRODUCE FRUIT / BLOSSOM? Plum trees generally start to produce fruits and blossom after three to four years depending on the variety, growing conditions and pruning. Plum tree blossom is produced before the leaves are fully out in most years. The use of the word "plum" in this article refers to gages as well. There is no reliable method to differentiate a plum for a gage although in general terms, a gage is sweet and used for eating only. A plum has more acidity in the skin and some varieties are for cooking only whilst others are used for eating and cooking. The classification between a gage and a plum is so mixed up and blurred as to be a waste of time in our opinion. Indeed some trees are intermediate between the two, Jefferson is a perfect example. Our advice is to forget the classification entirely, just read up about the plus and minus points for several varieties and use that as your basis for choosing. The final factor in choosing a plum tree is which variety to select. There are three different main types of plum as far as taste goes. Those which are only suitable for cooking jams, sauces, pie-fillings etc., those which are best for eating and those which do a good job for both. The problem here is that the choice of good plum tree may suit one person but not another, however, there are some favourite plum varieties which have stood the test of time. Click here for our in-depth reviews of the most popular plum tree varieties in the UK. Most plum tree varieties are sold as either bare-rooted trees or or container grown. Bare-rooted trees are grown in the open soil and then dug up prior to sale to the public. This type of plum tree will only be available from late autumn to late spring because bare-rooted trees need to be dormant at sale time. The chief advantage of bare-rooted plum trees is that they are much cheaper to buy. They have no disadvantages other than their limited time of availability. Container grown plum trees have been grown in a container and are sold in a container. They are available for sale all year round and this is their advantage over bare-rooted trees. However they cost considerably more to buy. One other disadvantage of container grown plum trees is that they will take slightly longer to establish themselves. We have two tried, trusted, cheap and quick recipes for plums - plum crumble and plum jam. We have moved the Plum Tree comments and questions section to its own page which can be visited by clicking here. On that page you can view all the previously asked questions / answers / comments and also ask any new questions of your own. The questions and answers page contains a large amount of additional information about plum tree problems.